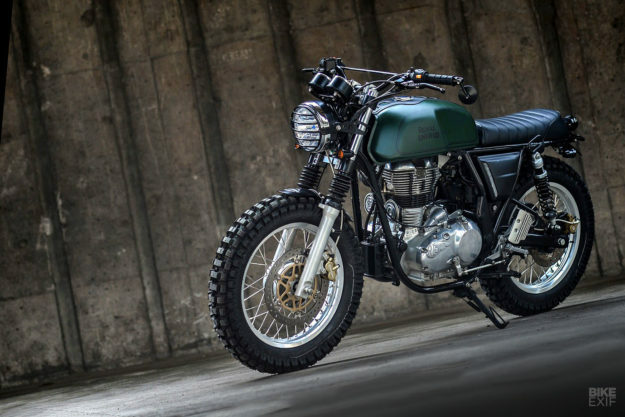 If there’s one manufacturer that should have a factory scrambler in their line-up, it’s Royal Enfield. 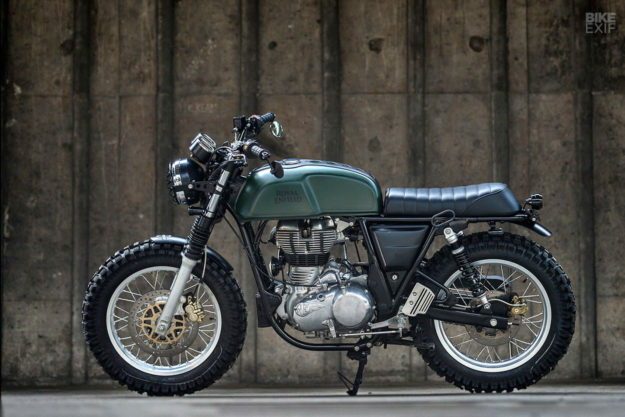 There’s hardly a square inch on the planet—paved or unpaved—that hasn’t been crossed by an Enfield thumper. 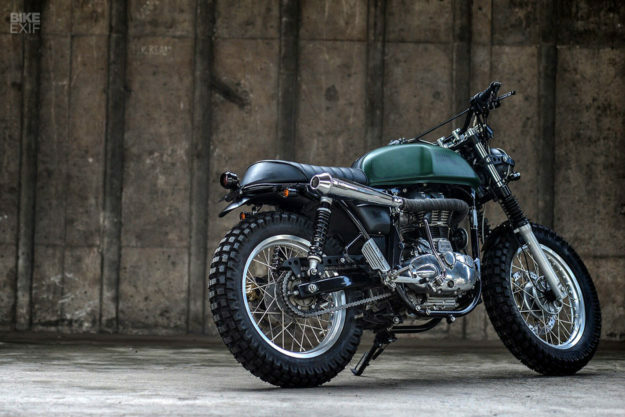 Sure, there’s the Himalayan, but we’re filing that one under ‘adventure-touring.’ What we’re looking for is a classic Enfield desert sled—a bike to go head-to-head with Triumph and Ducati’s own Scramblers. Even the Indian marque’s upcoming range of 650cc twins is curiously devoid of anything resembling that. So Bangkok’s K-Speed have decided to show us what RE could be doing. Led by the man simply known as ‘Eak,’ the Thai workshop turns out bikes ranging from the classy and practical to the downright whacky. But regardless of the brief, their builds are always cool and radiate presence. Something that’s not easy to achieve. 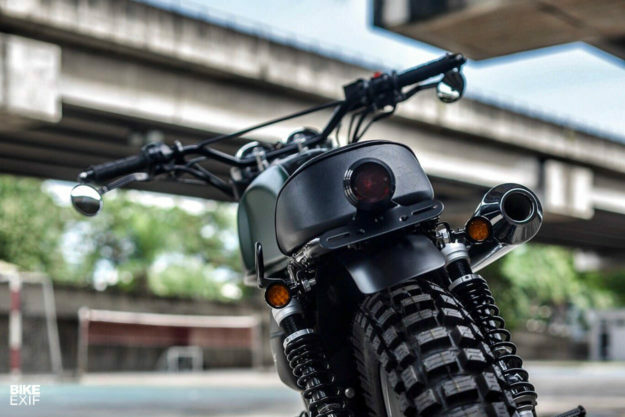 This latest project is a collaboration with Royal Enfield Thailand—who offered up a 2017 Royal Enfield Continental GT for Eak to reinterpret. 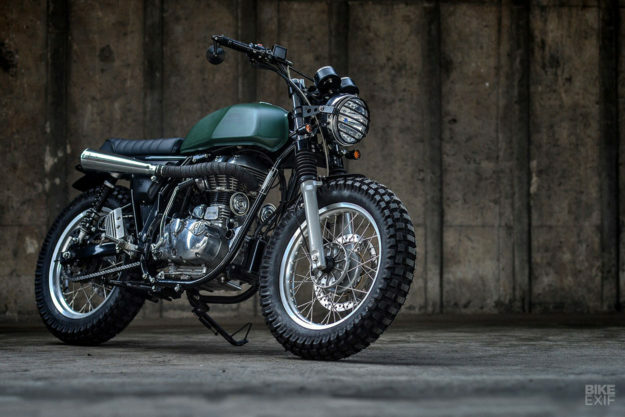 And he’s turned the café racer into a handsome sled, without even hacking the frame. The Continental GT’s rather pretty in stock form, so there was no need to ditch the tank, or re-work the tubing. K-Speed have binned the humped tail section though, replacing it with a full-length tuck-n-roll seat. They’ve reworked the ergonomics up front too, fitting a set of enduro handlebars. Since the GT comes from the factory with clip-ons, they needed to install a new top triple clamp to attach the bars to. Some of the cockpit is still stock—like the clocks and the switches—giving this scrambler a ‘could-have-been-stock’ vibe. K-Speed have added some subtle changes though, like BMX-style grips and CNC-milled bar-end mirrors. 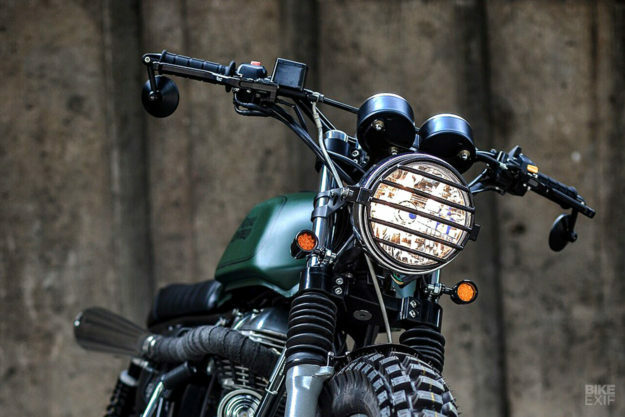 There’s a new headlight, attached to new brackets and protected by a custom-made grill. The front forks are stock, but they’re sporting a new set of fork boots. Other additions up front include a custom fender, and a pair of smaller turn signals mounted on hand-made brackets. The back’s been cleaned up too, with a one-off fender, a new taillight and a neatly tucked pair of turn signals. K-Speed also decided to give the GT a slightly more aggressive stance—and a little more capability in the dirt—by way of a new set of longer rear shocks. The original 18” spoked wheels fit the bill, so they stayed. Eak and co. simply wrapped them in classic trials-style rubber. 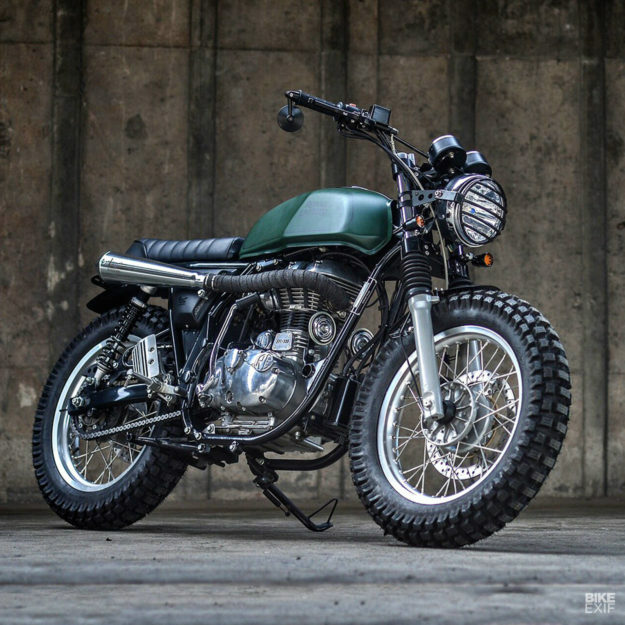 For one last shot of scrambler style, they fabricated a new, high-riding exhaust header, topping it off with a reverse-cone muffler. Fellow Thai custom outfit Libero Moto supplied the muffler, along with a couple of other parts. There’s a Libero tank strap too, and the Enfield’s also wearing better-looking side covers. The rest of the changes are extremely subtle—like the drilled-out chain guard, and the black powder coating on the triple clamps. With everything buttoned up, all that remained was to ditch the GT’s original bright paint job. 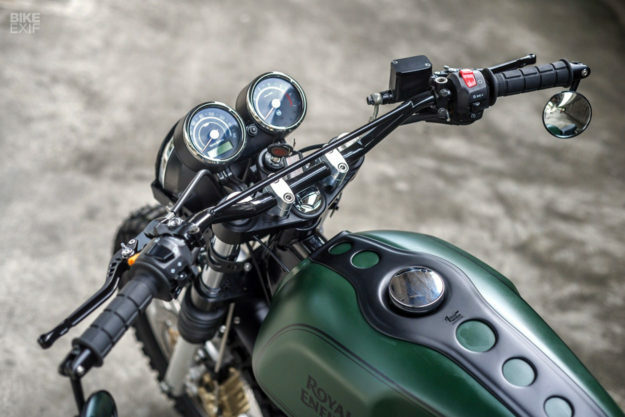 So K-Speed redid the tank in matte green, with a barely noticeable black pinstripe and classic Royal Enfield logo. We’ve seen K-Speed turn out far more extreme machines than this, but this chunky little GT is impossible not to like. 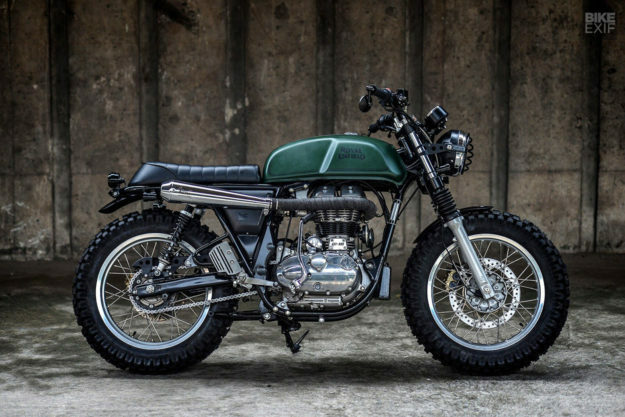 Maybe it’s the scrambler that Royal Enfield should make?